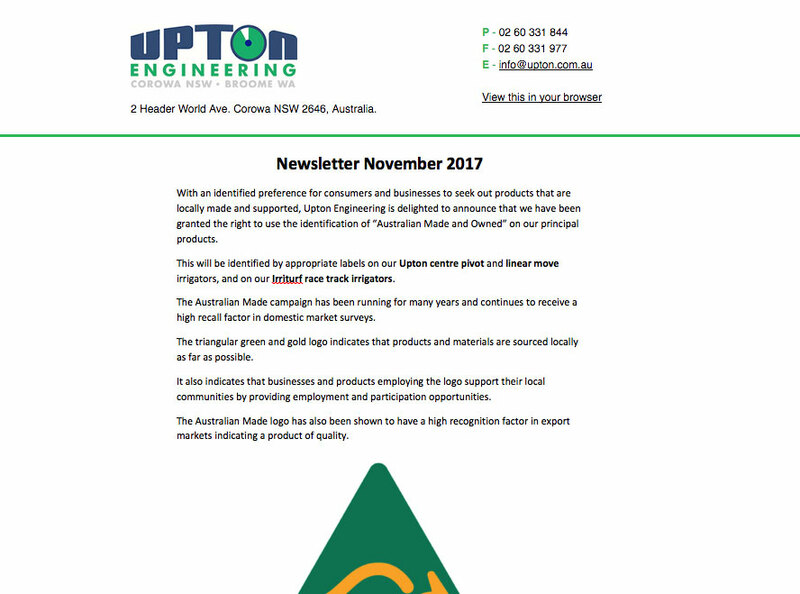 With an identified preference for consumers and businesses to seek out products that are locally made and supported, Upton Engineering is delighted to announce that we have been granted the right to use the identification of “Australian Made and Owned” on our principal products. This will be identified by appropriate labels on our Upton centre pivot and linear move irrigators, and on our Irriturf race track irrigators. The Australian Made campaign has been running for many years and continues to receive a high recall factor in domestic market surveys. The triangular green and gold logo indicates that products and materials are sourced locally as far as possible. It also indicates that businesses and products employing the logo support their local communities by providing employment and participation opportunities. The Australian Made logo has also been shown to have a high recognition factor in export markets indicating a product of quality. 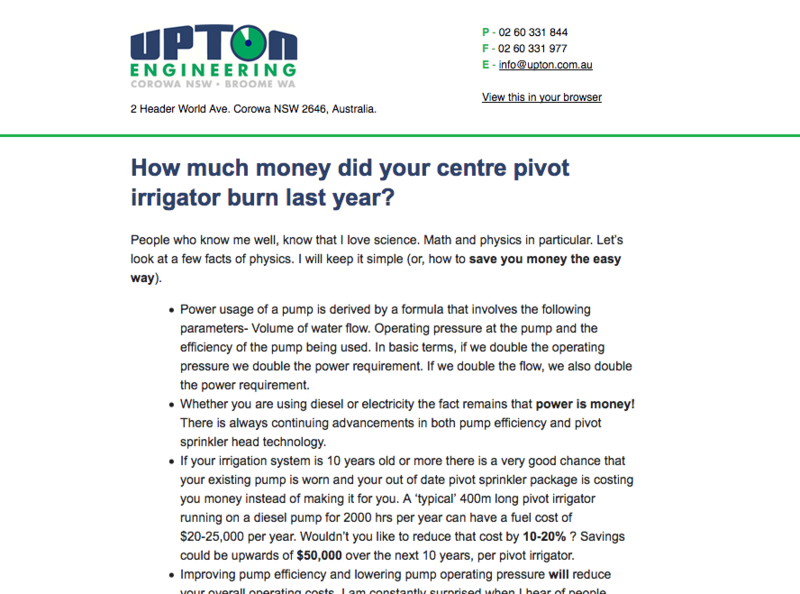 How much money did your centre pivot irrigator burn last year? People who know me well know that I love science. Maths and physics in particular. Let’s look at a few facts of physics. I will keep it simple (or, how to save you money the easy way). Power usage of a pump is derived by a formula that involves the following parameters- Volume of water flow. Operating pressure at the pump and the efficiency of the pump being used. In basic terms, if we double the operating pressure we double the power requirement. If we double the flow, we also double the power requirement. Whether you are using diesel or electricity the fact remains that power is money! There is always continuing advancements in both pump efficiency and pivot sprinkler head technology. If your irrigation system is 10 years old or more there is a very good chance that your existing pump is worn and your out of date pivot sprinkler package is costing you money instead of making it for you. A ‘typical’ 400m long pivot irrigator running on a diesel pump for 2000 hrs per year can have a fuel cost of $20-25,000 per year. Wouldn’t you like to reduce that cost by 10-20% ? Savings could be upwards of $50,000 over the next 10 years, per pivot irrigator. Improving pump efficiency and lowering pump operating pressure will reduce your overall operating costs. I am constantly surprised when I hear of people installing a new pivot system who do not know what their expected operating costs will be. This is a sure sign of an inexperienced irrigation company or sales person. People’s excuses will often be- ‘I got a really good deal’ or- ‘The guy gave me a cheap price on the whole package’. Purchase price has nothing to do operating costs. The operating cost over 10+ years is where your money is going to be either made or lost. Purchase poorly and it will cost you forever. Step 1 is accurately knowing what your current power consumption is. If you do not know what your pumping cost is then make it a priority today. It’s never too late to look at money saving changes. Most people work on a value of $ per ML pumped. Step 2 is to contact us to discuss how much money we can save you going forward. Also, if you haven’t done it yet, download our free Linear Move Irrigation Brochure. How much is fertilizer application really costing you? Fertilizer and trace element application is generally done by one of two methods- Dry spreading or injecting into the water stream of your pivot irrigator. To make a real comparison between the 2 methods simply write down a list of all cost inputs to apply each method. Dry application needs a tractor with spreader or a purpose built machine. Both options accumulate hours and general wear and tear on the machinery. Fuel usage and labour input by a skilled operator is also a considerable cost. Dry application is usually done when planting and maybe a couple times at the beginning of the crop cycle. In the case of taller crops like corn or sorghum, fertilizer application later in the crop cycle can become increasingly difficult without specialised and expensive machinery. Injection into your centre pivot allows precision application when the crop needs it most without over or under application. Fertilizers can be supplied as a bulk liquid or a small mixing/batch tank can be located next to the pivot centre to process dry chemicals. Mixing dry product can be a cost effective option when delivery costs are factored into remote locations. Fully adjustable injections pumps can be set to inject the required dosage per hectare and is applied during the normal watering cycle. Often overnight whilst you are sleeping. If you are interested in saving time and money talk to Upton Engineering about our new fertilizer injection kits. We can supply mobile kits for easy transport between site or a more permanent on-site package for pivots with large hectare coverage. Don’t forget to keep records of all your inputs and compare yields between the different fertilizer application methods. Higher profits will only come from greater yields combined with lower inputs. If you haven’t done it yet, download our free report on the ten most common mistakes people make with centre pivot irrigation.